If you’re travelling around Kutch, chances are that you will spend a day or two in the seaside town of Mandvi. After all, it is one of the region’s finest beaches and the beachside hotel, with its tented luxury, draws visitors who just want a few days of serenity by the sea. And of course, having the stunning Vijay Vilas palace and all its antique treasures right next door doesn’t hurt. But the next time you’re in Mandvi, tear yourself away from the beach and drive a few kilometres to one of the most unique places in India – the shipbuilding yard of Mandvi. Situated on the mouth of the Rukmavati River, this is where craftsman have been making large kotias (traditional sailing ships similar to the Arabic dhows) by hand for over 400 years. That’s right, by hand! The shipbuilding yard of Mandvi has a legacy of centuries of building large ships that have sailed regularly to the African coast and the peninsula of Arabia. As you drive into the lane leading to the wharf, you will be greeted by several ships in different phases of construction. Ribs sticking up into the salty breeze, they look like the skeletons of long dead whales that the mariners hauled home. Stop and talk to the workers around. Ask them what they do and they will show you around their part of the yard. Ask them nicely and they will help you clamber into the cavernous hull and then climb a rickety ladder so that you can enjoy the view from the deck, a few floors up. Ask a few more questions and they will tell you how their hierarchy works. The employee structure on each boat has four levels. At the top is the Gadiar or Engineer. His job is to supervise the building, give direction and catch mistakes. Below him are 1-3 Sarangs. They are his assistants and actually oversee the work being done. 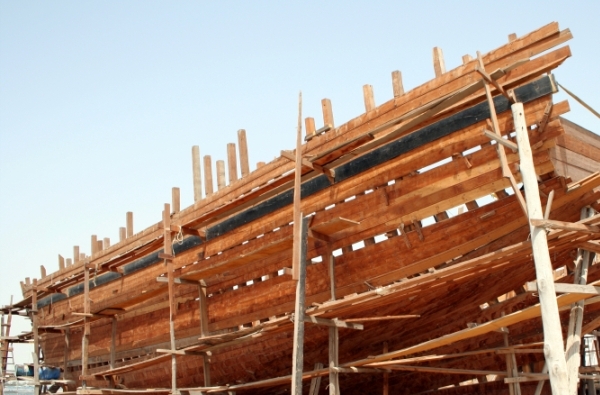 Under the sarangs are the Waddha, the carpenters who build the ship. And then are the Khalasis, the labourers. For hundreds of years, these boats were used to trade with markets across the Arabian Sea, and these vessels are made to last 2-3 decades. This is a traditional occupation and the men take great care in maintaining their decades-long family reputations. You will even hear of Sarangs not taking up the Gadiar’s job because they fear they aren’t ready enough, and may besmirch the family name. Today, maritime and aviation progress have meant that these boats don’t enjoy the prominence in trade that they did. And once powered by the wind, they are now towed to Dubai to have their engines fitted. But they are still preferred by many exporters when it comes to transporting perishable goods like dates and are made in a range of capacities,from 200 to over 2,000 tonnes. And you know the most incredible part? The engineers in charge of these boats are often illiterate! They draw up the plans and designs from experience alone! That interaction alone is enough for a musafir to take this detour!